Ok, we are going to have a vote on what we want the city layout to be. Vote for which ever one you want to do. If you have an idea of your own please post it and I will add it to the list to vote for. You can change your vote at any time. When we start the new map, the layout with the most votes is the one we will go with. I like sybers, id hope all the grey roads are all underground rail ways. I voted for scyber's as well. My thing was just a small concept, but I think Scyber's one is more developed. Also, my quick concept and Mrtnmines' are basically the same thing :P? I'm wondering why there are twin mines next to each other. I can understand having several shafts in different areas of the town, but right next to each other? If we want effective mining that seems kind of useless to me. Yeah, each section would be walled for defense. The mines are really just mine camps where shafts would be located. They can be placed anywhere. I just threw them on there so people would see how mine shafts would be handled. That won't necessarily be placed right next to each other. Also, there will be paths above ground connecting everything as well as minecarts to central hubs for quicker travel. 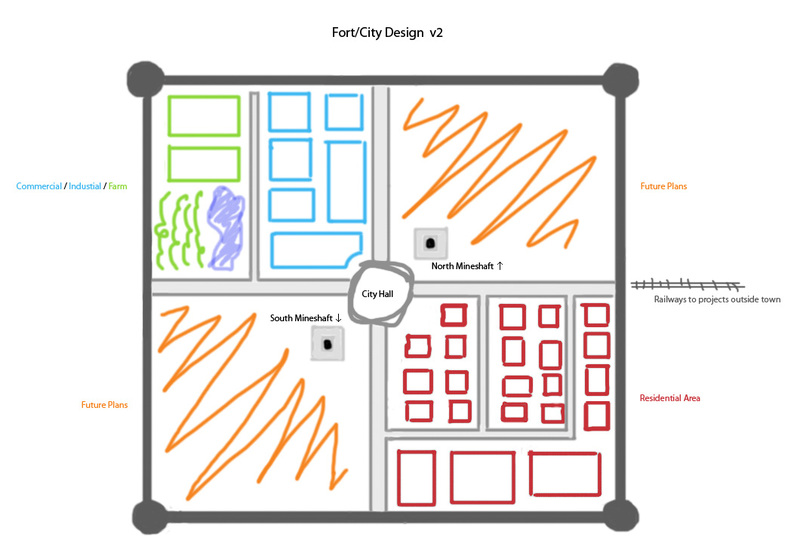 I voted for Mrtnmine because I think it's more efficient regarding spacing, leaving more room for expansion of the city, and making it easier to close off with walls. I don't really like the idea of everything being seperated by some space, a real city would not have gaps in it.. I didn't think that would actually be spaces, but that they were just separated by white in the image for clarity's sake. Am I or Macros right Scyber? There would be some separation but not as much as it looks on the map. It is spaced out more for clarity. The reason for seperating them is it makes it easier to keep everything walled while expanding. 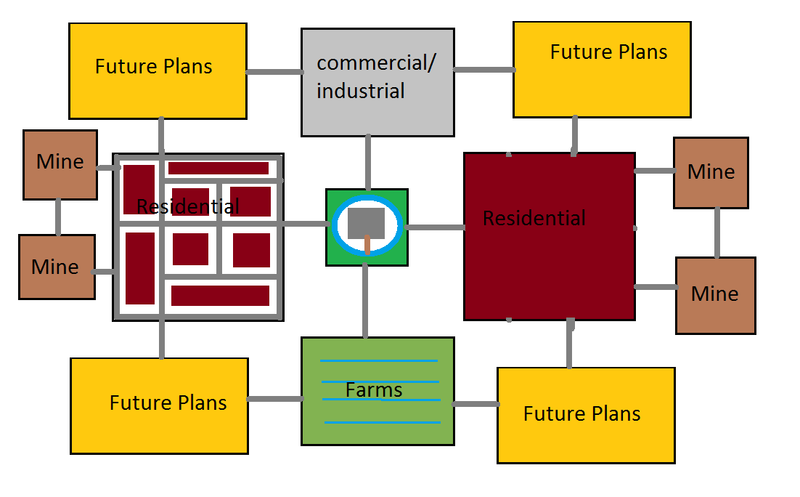 If the while city is in one wall, then when you expand, you have to take down the wall and rebuild it around the expansion. If it is separated, then you just build a new wall around the new project. Also, this separation allows for mountains and otherthings in the way without having to clear the whole area. I like Mrtn's as well. So what's up with this anyway? Are we working together to build a DiabloFans minecraft city? I'm so down if this is true. I make sure people go to jail. The only thing more fun is Diablo 3. Anyway, I'm not saying "vote for me" because my sketch was just a simple concept to see how it could look, Mrtn's sketch is basically the same, but a bit more developed. To be honest I don't really mind whoever "wins". I think both of them are pretty good. As for mineshafts, I dunno. I don't think they should be within the city itself. Sure you could have a shaft and then branch it out deeper down, but yeah, I dunno. removed liq's design and updated mrtn. It's dead even, so what does that mean? 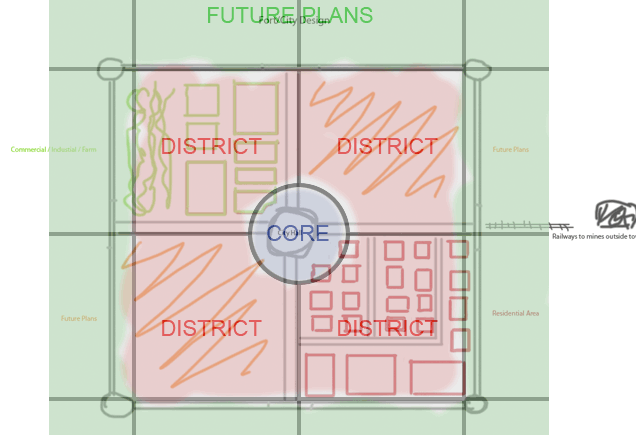 Also, in terms of personal housing, we are going to stick with something like a 20x20 plan for a personal area inside of the city right? Obviously people will want to build huge personal castles and stuff, but that should be done a little ways of yes? WE BUILT BOTH! ON-TOP OF EACHOTHER! This city is of course just a small piece of the world. There will be loads of space (infinite :P?) for other projects like big houses, theme parks and such. The city should contain the essentials though and be the main base. Just like a regular shaft in singleplayer, but just much larger/fancier to account for us being more than one guy! As for my sketch, give me a bit and I'll come up with something. Also, why has the server not let me on for the past few days? One more thing. I don't think the City Hall building should have the community chests in it. But that's personal oppinion. I don't know why you can't get it on. Myself and others have been on within the last few days. Are you sure you are typing in the right IP? One more thing, can we call it Vinland??? Please??? To avoid complications I was kind of thinking materials from the community mine should go toward city structures and outfitting workers tools, and guards weapons, etc. For personal property, people need to mine their own stuff. And for that I think we need to designate specific mining areas (although so far there hasn't been conflict), or some buddy system where two or more people share a mine space. The way I see it, it should be everybody gets it. Of course, mining tools, soldier weapons/armor, redstone for scientists, etc get first pick of the materials that their field requires, but then once they get what they need, everybody else would be able to get their stuff. Also, speaking of redstone, I was working on an idea for the gate, and was having some trouble with it. Anybody really good with redstone? I created a pretty complex door to my fortress. Involved a 6swotch combination lock with 2 buttons that would open it and then keep it locked once inside. You can check it out or I can show it to you some time tomorrow. And I can try to answer Any questions you have. Also, are you able to get on now? If not have you tried redownloading the game client. I am also planning on messing around with a mock up for our subway system, at least the aesthetics of it.